Many indie games tend to try and touch upon that feeling of nostalgia by bringing forth aesthetics that were around during the ‘90s. What few of these games tend to actually accomplish is delivering an experience that feels like it brings something new to the table alongside this retro feeling. 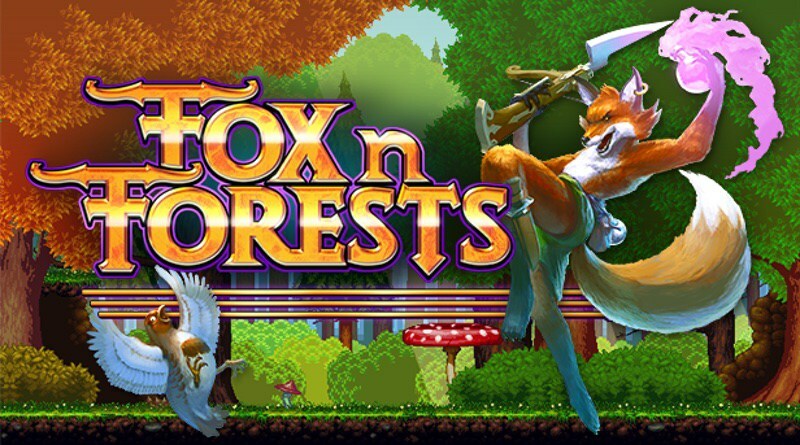 Bonus Level Entertainment has brought out Fox n Forests to try and touch upon this nostalgia with a little something new but does this mean it is still worth trying out? Fox n Forests begins with a fox named Rick trying to get himself a meal by preying upon a partridge named Patty. After getting seen by the bird, Rick is instead convinced that he should help out the forest by recovering pieces of the Season Tree that have been stolen away, putting the entire forest in danger. Equipped with a melee-capable crossbow and the ability to now swap between seasons on the fly, Rick must recover these pieces to save the forest. For the most part the storyline here for Fox n Forests tends to simply be the skeletal structure to set Rick on his adventure. There are little bits of humorous dialogue and bits of plot advancement as you make your way through the game but don’t expect anything too outstanding here other than the fact that Patty manages to recruit Rick so easily to the cause. 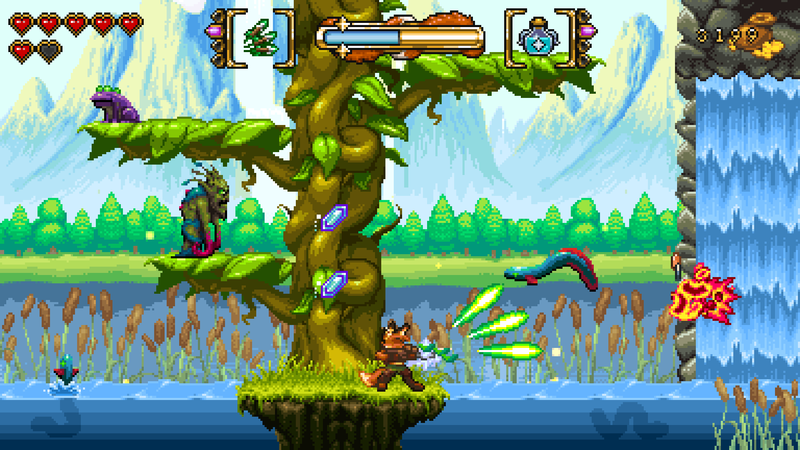 At its core Fox n Forests is a 2D platformer that allows players to shoot enemies with long-range crossbow attacks and take down foes at close range with a melee attack. Out of the starting gate Rick only comes with a few abilities, one of which is the standard double-jump, but in short order he is capable of learning a number of new tricks that will help him out in his journey, though the most useful one happens to be able to change seasons. With the use of his mana gauge, Rick can temporarily swap the season of any stage to a predetermined opposite season and alter the make-up of the level in the process. For example, Rick can turn waterfalls and lakes into frozen paths that allow him to easily navigate unclearable waterways or swap back to spring and allow trees to grow branches allowing him to jump previously unreachable areas. In fact there are numerous enemies and other hazards that can be avoided in this manner, such as extinguishing fires with fall rains and much more, giving every level some extra feeling of life and uniqueness to it. 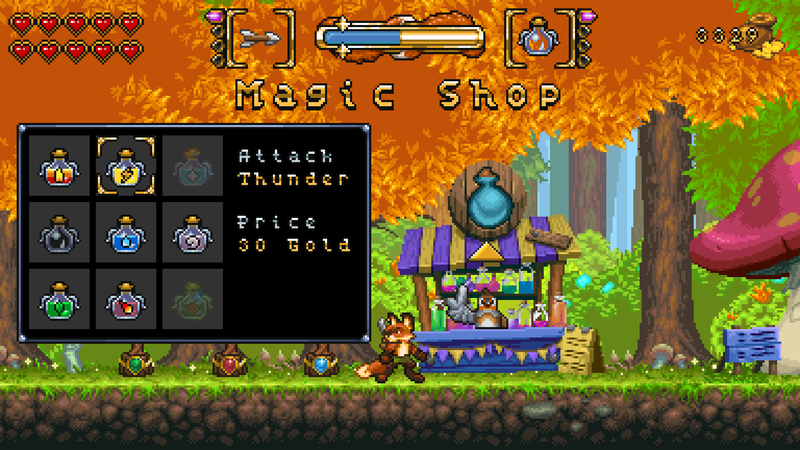 Progress through stages is a bit rough however thanks to the way that Fox n Forests limits progress on how many “magical seeds” you have gathered in previous stages. These seeds are hidden throughout the, rather large in scale, levels and if you happen to not find enough while simply progressing through them then be prepared to go back through and do some extra searching in order to advance, making some areas feel extra padded, especially when it turns out you’ve been searching for something you cannot reach anyways at the time. Thanks to the progression system that sees Rick gaining new abilities such as special arrow types and magic attacks that can be stored in battles, traveling through previous levels is a necessity as various pathways are locked behind areas that can only be breached with these moves. Outside of gathering magical seeds it is often worth exploring anyways to gather money and other collectibles that can be used to upgrade Rick’s abilities and give him more health. Outside of boss encounters it is rather rare to come under dangerous circumstances in normal levels thanks to how generous the game can be with health on normal difficulty but it never hurts to have a little extra insurance when you can get it. That being said, there do feel like there are some rather cheap elements from time to time that ring a little too close to home to some classic titles from the SNES era. Various enemies can be a bit annoyingly placed and can make for some cheap deaths while Rick’s hitbox often feels quite large for his rather lithe design. It is also worth noting that Rick’s controls can be a bit floaty feeling at times and at its worst the game can fail to recognize inputs, making for a few bits of damage that should have otherwise been avoidable. Also, while understandable from a design perspective, Rick’s inability to shoot his crossbow on the move is a bit annoying to get used to at the start. One of the best elements in Fox n Forests happens to be the boss battles that you take part in at the end of the worlds in the game. 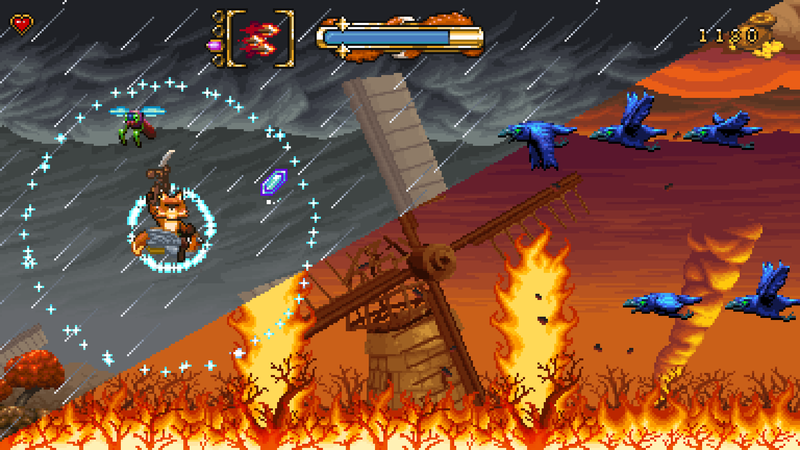 These boss battles are well designed and can be quite tricky as they require the use of not only the player’s skill in controlling Rick but also his ability to use the changing of seasons to his benefit, often allowing extra damage to be dealt when timed correctly. It is unfortunate however that despite all levels being able to be replayed, facing bosses is a one time affair unless you start over. 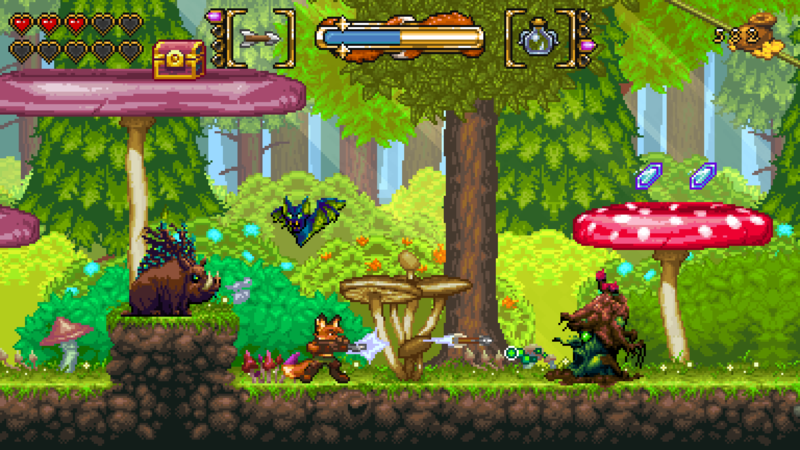 Sprite based games can either be simplistic in nature or can impress with their detail and thankfully Fox n Forests falls into the latter category. Rick and the various enemies you come across, even the standard foes, are nicely detailed with a wide variance of color between them. A lot of effort has went into making sure each stage looks great no matter what season you happen to be traveling through it in, making for an enticing looking environment, which is a nice plus considering the padded nature of some levels. As far as the soundtrack goes, the tunes that are used as the background music are rather standard fair for a game such as this but the sound effects do sound rather impressive. 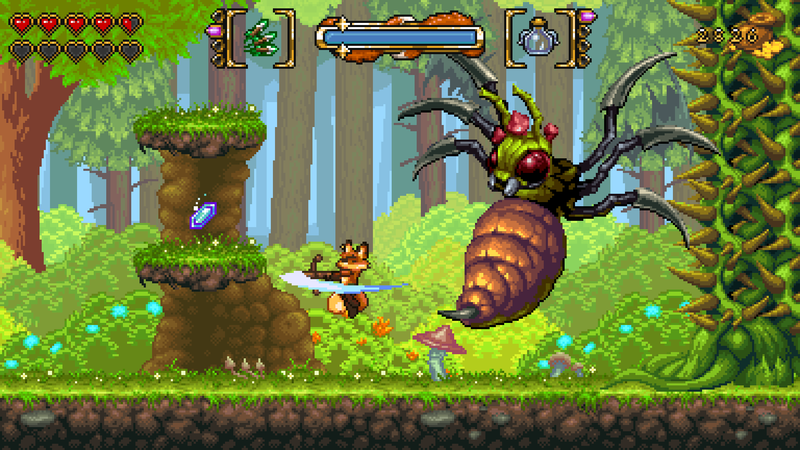 Fox n Forests makes for a rather fun and interesting take on 2D platformers. It may be a little short in the end as a standard playthrough can clock in at a little under six hours, but the fun gameplay, numerous unlocks that you can get for Rick, and the gorgeous design more than make up for this fun platformer that is designed to be played through more than a few times to experience it at its best. Fox n Forests' fun take on season shifting puzzle solving and gorgeously designed world make for a fun platformer with a solid combat system.